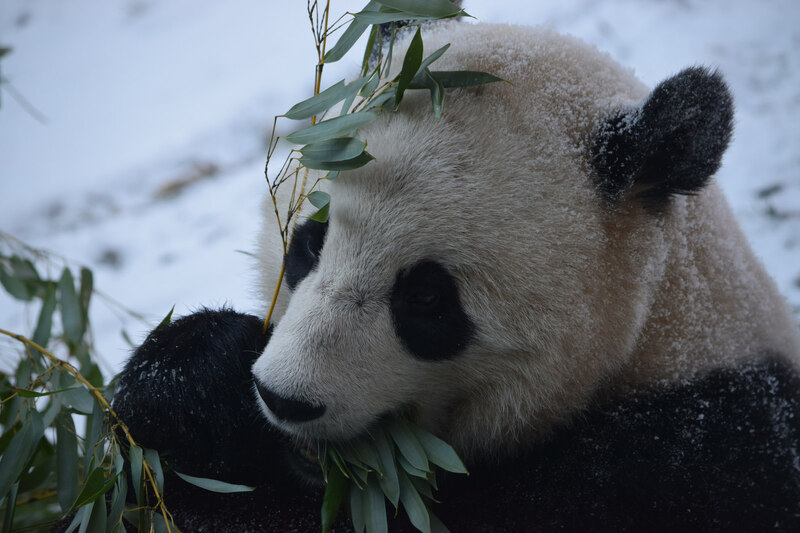 Muted moans of sadness punctuated the pandemonium that engulfed the Smithsonian’s National Zoo over the weekend as throngs of well-wishing visitors flooded through the Zoo’s Connecticut Avenue gates to bid adieu to giant panda Bao Bao. Bao Bao, the celebrated 3½-year-old panda born at the Zoo, will fly off to her permanent home in China Tuesday, Feb. 21. Lounging inside a specially outfitted crate aboard a panda-branded jet departing Dulles International Airport, Bao Bao will be served her usual bamboo, apple and sweet potato diet during the 16-hour flight. She will also be soothed by the familiar faces and voices of her keepers who will be close-by. The melancholy and high emotion experienced by fans at the impending departure of this star Washington native was offset by the knowledge that in China, Bao Bao will continue the work of saving her species from extinction. Following an initial quarantine at the Dujiangyan Giant Panda Base in China, scientists there will evaluate which male might make a good match for her, based on the studbook they maintain, explains Dave Wildt, panda reproduction expert with the Smithsonian Conservation Biology Institute. Wildt has worked with managers at China’s panda bases for more than 20 years, and he’s confident that Bao Bao will be happy and successful in her new home. 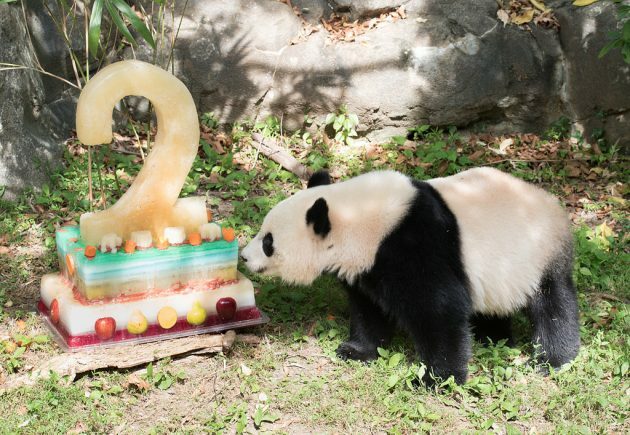 A human-habituated panda like Bao Bao would never be released into the wild, Wildt says, yet some animals raised at a breeding center in China’s Wolong reserve or at the Bifengxia facility in Ya’an are released into nature. They are raised in “special large enclosures in the mountains…much larger in size than you will find in most breeding or holding centers,” Wildt adds. “The idea is that a female presumed to be pregnant is turned into one of these enclosures were she is monitored using lots of remote cameras, and gives birth. The youngster then is raised by its dam without any human contact.” To get a closer look at the cubs, staff occasionally enter the closures wearing panda costumes. 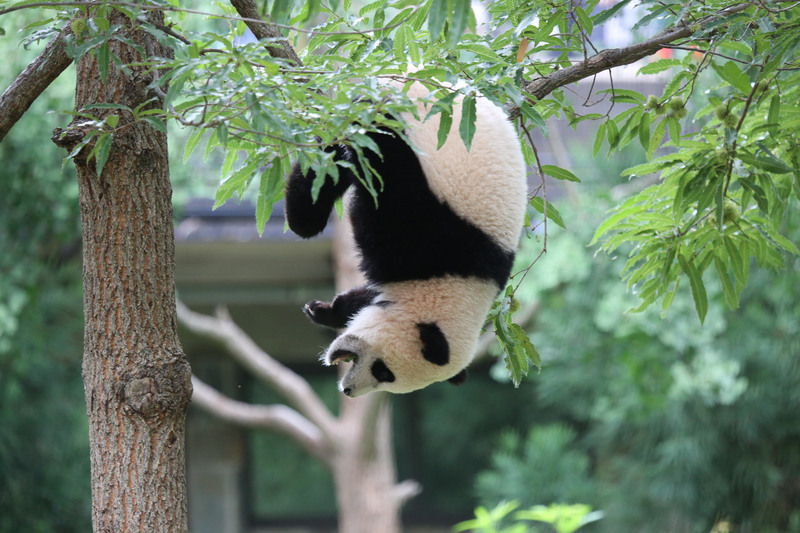 Insider also caught up with the Zoo’s panda curator, Michael Brown-Palsgrove, during his final days of managing Bao Bao’s Washington, D.C. residency, to ask him a few questions. Q: What has the mood been like at the Zoo these last few weeks? Brown-Palsgrove: We’re really down to the wire here! The keepers realize what a big endeavor this is—they’re spending a lot of time making sure Bao’s comfortable for this transfer. They’re also making sure her visitors and guests have their opportunities to do their goodbyes. Q: Has Bao Bao seemed stressed at all by the extra attention? Brown-Palsgrove: She’s getting a lot of extra treats, and is probably feeling pretty spoiled right now. But I don’t know if she knows what that means. From her point of view, it’s just a really big party. Q: How has your team prepped Bao Bao for travel? Brown-Palsgrove: We installed the shipping enclosure right into one of the transfer chutes that go from her indoor enclosure to the yard, and we’ve been moving her through that on a regular basis. In the last week or so, we also began to close the doors. She has shown no hesitation to move through it, and when the doors are closed she’s been very calm. We want it to become a safe space for her, and make the move as positive an experience as it can be. Q: What will Bao Bao’s keeper, Marty Dearie, do while he’s traveling on the plane with her to China? Brown-Palsgrove: Here at the Zoo, Bao Bao eats and sleeps most of her day, so Marty will try to keep up that routine. He’ll offer her fresh bamboo, make sure her water is fresh, and bring along some of her other food items like apples and sweet potatoes. The keepers are also constantly talking to the animals, and part of their training is verbal cues. So I’m sure they’ll have a little chatter while they’re on the trip. Q: How will Marty help Bao Bao’s transition to her new home? Brown-Palsgrove: Having a reassuring caretaker there will be helpful moving through her new spaces and new routines. To hear a familiar voice the first time she goes out into her new space might be helpful in getting her acclimated. But pandas habituate to routine fairly quickly—once she realizes where the food is, it should be fairly straightforward. Q: Might the National Zoo now have an opening for a new baby panda? Brown-Palsgrove: We’re hoping [Mei Xiang, the Zoo’s female panda born July 22, 1998] will come into estrus this year, but there are no guarantees. Her male cub Bei Bei [born Aug. 22, 2015] isn’t completely weaned—that’s the next step. We’ll look at behavioral cues from them and begin the process. He’s already not nursing as frequently, and they’re spending more time apart, so we’re definitely already seeing some of the cues. Q: What are the next steps for continuing the success of panda breeding programs? Brown-Palsgrove: The next hurdle really is panda habitat and conservation. We know how to breed and produce pandas in a captive setting, so the next question is what do we do once they’re out in the wild? Part of it is making sure they can find other pandas, and that there aren’t little islands of pandas separated from one another. Q: Are there other animal species that benefit from the work that’s been done with pandas? Brown-Palsgrove: Many. Pandas are considered an umbrella species—the panda habitat work that we’re doing along with our partners in China benefits many different species as well. Q: What do you wish people would ask about pandas that they don’t ask often enough? Brown-Palsgrove: I hope that people think about that it’s more about the population of pandas as a whole. I’ve been so surprised by how loved the Zoo’s pandas are, what celebrities they are—people have watched Bao Bao grow up, and have been following her since she was born. People get so attached to individual pandas, but we hope they also consider the role Bao Bao will be playing in China, and what we need to do to help the entire species succeed.